FBU Top Gun Showcase & The U.S. Army All-American Bowl – 2017! Chris Sailer Kicking and Rubio Long Snapping have a long-standing partnership with the All-American Games’s Football University (FBU). FBU combines position-specific technique training with NFL-experienced coaches. They are also the largest football training service in the US. This partnership is special as it allows for the pooling of resources to give you MAXIMUM EXPOSURE & TRAINING. 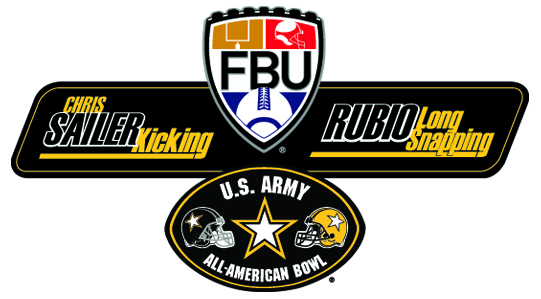 Since Chris Sailer Kicking and Rubio Long Snapping are the official specialist selection partners, each year, we have the honor of choosing six specialists (2 Kickers, 2 Punters & 2 Long Snappers) to participate in the US ARMY ALL-AMERICAN BOWL and Football University’s ALL-AMERICAN BOWL GAMES (Freshman All-American Bowl & 8th Grade All-American Bowl). All selections will be made at the FBU TOP GUN SHOWCASE on July 7th – 8th, 2017 in Rock Hill, South Carolina. *You DO NOT have to participate in an FBU regional camp to qualify this year. *To be considered for the US ARMY ALL-AMERICAN BOWL, you must participate in the FBU TOP GUN SHOWCASE. Lock in your spot for the TOP GUN SHOWCASE TODAY! Coach…Please allow me to warm up before you want me to snap live in practice. Think about it, would you really have your starting QB sit for 30 minutes and then tell him to throw a perfect 45 yard post? I didn’t think so. Please take my craft seriously. I know you don’t think much of it, but I do. To me, Long Snapping is a main part of who I am now and who I plan to be in the future. Please don’t just give me some lineman pads because I am on the line. I need to be able to move my arms. They actually make pads for my position. I swear they do. If you can find money in the booster fund for QB pads, maybe there is some funds for me as well. Please don’t just rush past my snaps on film. Just like other players can learn from film, so can I. If you don’t want to watch, maybe just allow me some time to watch on my own. I want to get better, allow me to do so. Please treat me, and my position, with respect. I deserve it and so does anyone that plays Long Snapper. It is not the easiest thing to do and should be highly respected. If you think I am off on this one, try playing a game without a Long Snapper and see how that works out for you and the team. Coach, please listen to me. Once again, Rubio Long Snapping and Chris Sailer Kicking will be teaming up with FBU to run the specialists portion of their camps. FBU is the world’s largest football training service and has hired us to handle their Long Snapping section. It is an honor and we are proud to do it again. It is a top notch organization that benefits countless athletes across the country. Rubio Long Snapping will be running more camps than EVER. This year I will only be at the TOP GUN CAMP. All other locations will have two Rubio Long Snapping Senior Instructors in attendance (staff members that have been with me for well over 30 camps). They will follow the same format as myself and report directly to FBU and yours truly. These camps do have smaller numbers than our regional camps and are MUCH more instructional based. Rubio Long Snapping will be choosing the two Long Snappers that will participate in the US ARMY ALL-AMERICAN BOWL at the FBU TOP GUN CAMP in South Carolina on July 14-15. Rubio Long Snapping will also be selecting the East Bay Youth All-American for the Class of 2019 (Freshman All-American Bowl) and 2020 (8th Grade All-American Bowl) at the FBU TOP GUN CAMP in South Carolina on July 14-15. You MUST be invited to the TOP GUN camp by performing well at one of the regional camps prior to the TOP GUN Camp. Bottom line, you will have to do well at one of the camps, that our staff is in attendance at, to pick up an invite from myself and/or one of my senior instructors. ***Rubio will be in attendance. Chris Rubio of Rubio Long Snapping offers up some quick advice to high school coaches and what they should do with their Long Snapper. ASK RUBIO – Redshirting in High School? Best Looking on 90210? Potential NFL Long Snappers? Liking Sailer? It would depend on when you hold the athlete back. If it is done sooner in life, I feel that is better. When you get into the high school years, it could really mess with their demeanor as they will be losing a lot of friends at that point. Bottom line, if you are going to do it, do it EARLY. You have explained to us how you are able to recognized college long snappers out of high schoolers, but what do you see in college snappers to be potential NFL Long snappers? Also, how can a snapper adjust to be a more appealing prospect? There are a couple differences between a college Long Snapper and an NFL Long Snapper: Size (NFL Long Snappers usually are right around the 240+ range), Accuracy (an NFL Long Snapper might not always be the fastest Long Snapper you have ever seen but they should RARELY, and I mean RARELY miss….think two out of 100) and Blocking. The last point, blocking, is a massive aspect that kills a lot of guys chances at the next level because they either never did it in college (thank you spread formation) and can’t get used to it quickly by the pro day. The speed jump from high school to college is quadrupled from college to the NFL. Not being able to keep up with that jump is what kills hopes and dreams of a college Long Snapper trying to make the NFL. At the Rubio Long Snapping College as well as the NFL Free Agent Camp, we will work on blocking a ton to make sure each Long Snapper is a more appealing prospect. Did you like Sailer when you guys played together at UCLA? Yes, I actually did BECAUSE he never acted like a “kicker” 🙂 He would get back, do his little step thingy and kick the ball. IF he missed, he would never blame me (not that he could, I was throwing pearls back there) and just go to the next kick. He had very much a lineman attitude and, ironically, used to always hang out with me and the lineman. Happy Ranksgiving to the Long Snappers from the TX Camp! The rankings are completed for ALL Long Snappers that participated in the Rubio Long Snapping Nike Fall Camp in TX on November 10! My rankings ARE done by me and only me. That is why I am at all my camps. Long Snappers came out to TX to attend the Nike TX Fall Camp on November 10th from AR, CA, CO, GA , KS, LA, OK and TX to get the best instruction and exposure in the country for Long Snappers. Long Snappers, and their parents/guardians, were instructed on the field, had a film and classroom session, a recruiting seminar and ended the day with a competition with Rubio present and running the camp. Each Long Snapper was filmed and will have a player profile provided for them on RubioLongSnapping.com. Ryan Shalosky was the winner of There were many new Long Snappers, as well as some dominant veterans, as Rubio Long Snapping embarked on the Dallas area. One Long Snapper, Ryan Shalosky of TX, really got into a nice groove and was nails under pressure was crowned the champion of the camp and earned a free admission to the 12th Annual National Snapping Event in Las Vegas! He is extremely accurate and consistent with his punt snaps. Ryan also is a tremendous athlete that moves as well as anyone in the country on his feet. Ryan Shalosky was the winner of the Rubio Long Snapping Camp in TX!!! Ryan was not the only Long Snapper to shine out in TX. These others did well as well…. Jordan Frese was excellent and smooth all day. One of those Long Snappers that just keeps getting better as the day progresses. JC Everett is a big, large, strong Long Snapper that snaps easy D1 speeds right now. Clayton Jackson performed well, yet again, and continues to impress me with how smooth he is. Bobby Joe Nielsen has excellent form and is snapping the ball hard. Nathan Lucas was on fire all day and is dripping with potential. Ben Asbury showed a lot of promise and listens very well. Michael Poujol was on fire all day long in TX. Michael Poujol was one of the best 2015 Long Snappers in attendance. He has a great frame and is getting better by the day. Matt Foley came out from in CA and was smooth and great all day long. Love his attitude. Tipa Gaileai has a tremendous frame and could have the most potential in the entire class. George Madden is a beast that could easily end up a 5 Star Rubio Long Snapper by Vegas. Grant Merka was very impressive and had a huge jump in the rankings! Garrett Stotts is big and just keeps getting better. Travis Arroyo out performed all other sophomores in TX. Great attitude and snapper. Geron Eatherly is smooth and getting better with each snap. Jon Letter was VERY impressive in TX. Growing quickly and using it all for snaps. Keep an eye on him. Evan Pohlman was solid all day with great form and balance. Hunter Ryan handles pressure well and is built very long. Garrett Jackson has great size and lots to build upon. Good attitude and he is well on his way to greatness. The next stop for Rubio Long Snapping camps will be in Illinois on November 24, Georgia on December 7, North Carolina on December 8th and back to California on January 12. All camps lead up the biggest Long Snapping event of the year, the 12th Annual National Kicking and Snapping Event in Las Vegas on January 18-19, 2014! Here is the initial watch list for the 2013 Chris Rubio Award. These Long Snappers have proven, through multiple stats, that they deserve to be on this list to possibly win the award on January 17, 2014 in Las Vegas, NV. The members of this watch list will now be required to provide no more than a one minute updated highlight tape (on YouTube), a letter of recommendation (scanned and emailed to Rubio@RubioLongSnapping.com) from a current coach, a current teacher and a reporter that covers their area explaining why they deserve to win this prestigious award. Everything mentioned above needs to be emailed by no later than November 2o, 2013. If all is not received by November 20, the Long Snapper will not have a chance to win the award. Following review of all the material, a semifinal watch list will be put on December 1st. The time of the year when your “friends” that don’t have any plans, try to derail yours. The time of the year when you worry that you may never see your friends again. The time of the year when the sun rises earlier and sets later. The time of the year when temptation beats on your door. The time of the year when you would rather be anywhere but sitting in a desk. The time of the year when when you long to just be outside. The time of the year when you look around and wonder how different your life will be one year from today. The time of the year when you wonder if anything will be the same one year from today. The time of the year when so many are relaxing and taking some time off. The time of the year when a select few are working their tails off. The time of the year when the good can become average or great and the great can become good or superb. The time of the year when your parents have hit your last nerve. The time of the year when your kid has hit your last nerve. The time of the year when you want to leave. The time of the year when you wonder if you are ready for the next step. The time of the year when you are itching to sprint into the next phase of your life. The time of the year when you wonder if you are ready for it all. The last months of school will forever affect you and your life. If you are a high school athlete reading this, you live in a small town. It may not be the smallest of towns, but it is a small town nonetheless. Twenty years ago, it would have been extremely tricky for you to get recruited by a college. That is no longer the case. Recruiting is much different now than it was 20 years ago. Before, it was all on your coach and what he/she could do for you. And, since you are in a small town, a coach would degrade your talent as being just the best of what is available. Sad, but true. With less people, usually comes less talent. That is simple math. Therefore, the athlete has to prove to the college coach that he/she is not only the best in their small town, but they are also one of the best in the country and that the coach should undoubtedly recruit them for the next level. Nowadays, with the proper use of technology, athletes can easily expose or “sell” themselves to colleges across the country. No matter if you are from a small town or a big city, the playing field is equal for all athletes on the Web. Technology allows even the smallest-of-town athletes to reach the biggest of city universities – instantly and for free. Athletes can create a YouTube channel to highlight their games, practices and improvement over their careers. An athlete can create a Facebook and/or Twitter account to get in contact with a coach and send them film. All of the above is fine and dandy, but if you still aren’t a top-tier athlete you won’t get past hello with the coaches. Once you have set up your social media outlets to get your recruiting process going in the right direction, you need to let your current coach know that you are serious about playing sports in college. Let them know you have the desire to push yourself to do what it takes to play a sport at the next level. Your coach will also be able to contact coaches on your behalf and give you some insight into the whole recruiting process. Plus, if you have expressed your desire to the coach and shown you have talent, he/she is undoubtedly going to remember your name if a college comes into their office recruiting another athlete. “Oh yeah, Sally is a great right fielder. You should also check out my pitcher Julie.” Now your name is in the coach’s head. They will ask for film (you will simply send them your YouTube link) and now your recruiting starts to pick up speed. If you are really serious about your athletic ability, you need to look into a very good personal coach that specializes in your exact talent. A high school coach is good but they have to focus on the whole team and not just one athlete. They will often tend to know a little about a lot, while a specialized coach will know a lot about a little (think one particular position or aspect of the sport). Plus, your personal coach, if he or she has been around the block and has put other athletes into college, will have many contacts as well that can help you out in the recruiting process. Every college will hold camps during the summer that athletes can attend to learn and prove themselves. These camps are less for learning (too many athletes attending) and are more for tryouts. You do not need to be invited to but it helps if you are so they know who you are going into the camp. You really want to focus on these camps between your junior and senior years. However, I would highly recommend going between sophomore and junior years to get your name in their head and get a trial run of what the camp will entail. To be invited, simply have your current sports coach contact the school and say they think you should be invited. If your coach isn’t really motivated to help you, contact the school yourself. Give them some simple stats and let them know you are very interested in becoming a _____ (mascot of your choice). You are now in the school’s recruiting database and will now start to receive mail from them on a regular basis. Once you get to the camp, you must dominate. Remember, an immediate knock on you as an athlete will be that, being from a small town, you aren’t playing against top talent simply because there aren’t as many athletes. Now, at the camp, you will be head-to-head with the actual top talent from all over the country. This is the moment when either you prove you have the ability to be playing with the big dogs or are simply the best of the average. It is all on your shoulders at this point. Yes, you are an athlete from a small town, but you have set yourself up to be on the big stage. Do you have the talent to be there? Can I Change my Mind after a Verbal Commitment? The high school football recruiting process can be a lengthy one, and you may be thrilled to finally receive an offer to play at one of your top choice schools. It’s common to feel pressured to respond to offers quickly, and in many cases, you’ll do this by making a verbal commitment. This is when you tell the recruiter or coach that you are planning to play at their school. However, this verbal commitment is not a binding one. The only binding commitment is signing a written contract. There are some cases when you may want to change your decision after making a verbal commitment. Maybe your dream school came back with a surprise offer that you would rather accept. Or perhaps the scholarship you thought you were getting from the school you made a verbal commitment to wasn’t as generous as you first thought. After making your verbal commitment, it’s important to do your research and make sure this is the school you actually want to go to. If you decide otherwise, politely let the school know you have changed your mind and will be pursuing other options next year. Contact Rubio Long Snapping for more information on Verbal Commitments. What to Look for in a Long Snapping Camp? Exposure – The main ingredient in getting to the next level and Rubio Long Snapping offers the highest quality of exposure for its Long Snappers. Player Rankings, Player Profiles, National Recruiting Websites like Scout.com, ESPN.com and Rivals.com, National Events, Social Media, Youtube, Video, Blogs and much more! 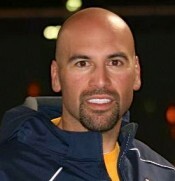 Personal Instruction – Chris Rubio of Rubio Long Snapping attends and instructs at every camp. Rubio does not pawn his Long Snappers off to any old coach instead he trains his guys on every snap. This is extremely important when looking at camps to ensure top quality instruction. Relationships – Meaning, next level relationships with major College Football Programs and NFL staffs. Rubio Long Snapping is the go to source for College Football Recruiters at four year Universities and beyond with contacts with agents and NFL staffs. College Football Programs take Rubio Long Snapping opinions and recommendations into the highest of consideration in the world of Long Snapping and now NFL is on board as well with all of Rubio’s Long Snapper continue their careers. Results – Where have previous camp participants gone on to play? Will this camp help me springboard to the next level? Well click here to see where the latest of the Rubio Long Snapping players have committed to play next fall and click here to see a list of the previous year players and where they landed. As you can you see Rubio Long Snapping offers everything in a Camp that any Long Snapper could ever need. Visit RubioLongSnapping.com for details on our upcoming Camps. A 2013 graduate of West Henderson High School in Hendersonville, North Carolina, Chase McIntyre has proven himself a consistent Long Snapper, as well as playing starting center. McIntyre is committed to Appalachian State University. A 2013 graduate of North Posey High School in Poseyville, Indiana, Chris O’Risky is effective in multiple positions, serving as starting Long Snapper, starting center and starting defensive end both his junior and senior years. O’Risky is committed to Eastern Michigan University. A 2013 graduate of Whitefish Bay High School in Whitefish Bay, Wisconsin, Graydon Peterson is an honor student and all-around player, serving as starting Long Snapper and starting center, as well as reserve defensive tackle. Peterson is committed to Dartmouth College. A 2013 graduate of Duncan High School in Duncan, Oklahoma, Caleb Longest is a total package Long Snapper with good size, good form and good movement. Longest is committed to Northwestern Oklahoma State University. A 2013 graduate of Rockwood Summit High School in Rockwood Summit, Missouri, AJ Hantak is a tall, sturdy, athletic Long Snapper who moves the ball with both accuracy and speed. Hantak is committed to Eastern Illinois University. A 2013 graduate of Cathedral High School in Lebanon, Indiana, Austin Orr served as starting varsity Long Snapper since his sophomore year and played on two state championship teams. One of Tom Lemmings “Top Prospects,” Orr is committed to Howard University. A 2013 graduate of Neville High School in Monroe, Louisiana, Trey Lamastus is a consistently accurate Long Snapper, and winner of the Nike Spring long snapping camp in Texas in March 2012. Lamastus is committed to the University of Louisiana at Monroe. 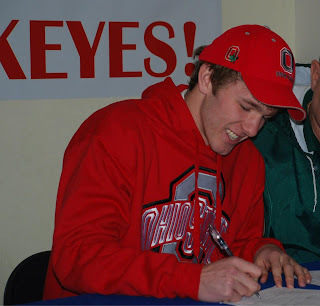 A 2013 graduate of Pickerington Central High School in Pickerington, Ohio, Nick Walter has played as starting Long Snapper since his sophomore year and starting center since his junior year. Walter is committed to Miami University of Ohio. A 2013 graduate of Whitewater High School in Fayetteville, Georgia, Trevor Morgan is an all-around athlete. Along with serving as starting varsity Long Snapper, Morgan is a 1st string wide receiver and backup quarterback. He is committed to the University of Memphis. A 2013 graduate of Copperas Cove High School in Copperas Cove, Texas, Justin Greene is a smooth, precise Long Snapper with good form and a hard snap. Greene is committed to Air Force. National College Signing Day for 2013 has concluded and once again Rubio Long Snapping is in the middle of the action. Alabama, USC, Nebraska, and Michigan top the list of schools that have received commitments from Rubio Long Snappers. Other promising Rubio Long Snapping alumni include Zach Smith to USC, Chase Domiguez to Utah, Gabriel Miller to Nebraska, Scott Sypniewski to Michigan. Brendan Turelli to Wyoming, Mike Lizanich to Tulane and Tucker Estheridge to Louisiana Tech. In all thirty two Rubio Long Snapping alumni committed to major college football programs reaffirming that when it comes to Long Snapping Rubio leads the pack. Click HERE for the complete list and visit rubiolongsnapping.com for more details on upcoming camps and the value of being a talented high school Long Snapper. To see a full list of Long Snappers that have gone through Rubio Long Snapping and went onto college, and beyond, click HERE and enjoy! Watch Out Vegas, Long Snappers from all over the world are coming!! Vegas has never seen an attraction of this type, the finest Long Snappers in the world invade the desert! Rubio Long Snapping is holding their annual “Inter”-National Event on January 19th-20th at Faith Lutheran High School in Las Vegas! The two day event is a showcase of the finest prep talent and coaching in the world of Long Snapping. Players will compete for the highest of rankings in the world of Long Snapping. Former attendees of this event are currently playing at major D1 Schools and even the NFL. Stay Tuned following the Event for player rankings and all the events results. Rubio Long Snapper Scott Shockley Needs YOU! Those of you that have been with me for awhile know about Scott Shockley. Scott is a 2012 Rubio Long Snapper from GA. You can see video of him here from 2011…. That was his second camp and you can tell he was definitely headed in the right direction. Long, lean and strong. Bright future to say the least. Right after that camp, Scott found out he had cancer. He went from the brightest of futures to not knowing what was going to happen next. As I type this, I can’t help but break down when I think of it all and how difficult it must be for him and his parents. To clarify, Shockley is an 18-year old Long Snapper and three sport athlete who was diagnosed with osteosarcoma (bone cancer) in his right femur in May 2011. He underwent surgery to the replace the diseased bone with a titanium endoprosthesis and eight months of chemotherapy treatments. Scott was in remission until September 2012 when the cancer returned in his lungs. He has undergone additional chemotherapy treatments and one lung surgery to remove some of the tumors and part of his left lung. He will be starting a new chemotherapy regimen in hopes of shrinking the remaining tumors so they can be surgically removed. Scott needs everyone’s prayers and support as he continues to fight this battle. Q: Who is the toughest Long Snapper you have worked with? A: Tough one. Rubio Long Snapper Carson Tinker of Alabama is a solid choice as he has overcome a ton this past year but I am going to go with Rubio Long Snapper Scott Shockley. Scott is a 2012 Long Snapper from GA that, one year ago, was diagnosed with a rare form of bone cancer called osteosarcoma. He has gone through MANY surgeries in one short year and is continuing to go head to head with chemo. Kid came straight from the hospital to my GA camp this weekend to say hello to me and the guys. He is a soldier and everyone needs to keep him in their thoughts. SCOTT IS HAVING SOME TROUBLES, big troubles, as you can imagine, and I want you all to get involved IMMEDIATELY. His parents have created a blog, so to speak, that automatically sends out updates to those that register. I want you to register and I want you to do it NOW. I want you to find it in your heart to spray out to Shockley and let him know that you are with him. I want you to keep up with him. I want him, and his parents, to know they are not alone through this extremely trying time in their lives. Here is what I need you to do. Go to: http://www.carepages.com/signup and fill out the information and create a password. Once you are a member, go to visit on care pages. Scott’s care page website name is shocman17atl. Enter it and takes you to his webpage. Let’s show Shockley what being part of the Rubio Long Snapping family is really all about….